Earlier this month, researchers at the Laser Interferometer Gravitational-wave Observatory (LIGO) announced they had detected gravitational waves, confirming a prediction by Albert Einstein in his theory of general relativity. Massive objects accelerating at extremely high speeds, such as two colliding black holes, can radiate enough energy during their collision as to ripple the very fabric of space-time, causing the force of gravity itself to oscillate. LIGO is supported by the National Science Foundation and operated by Caltech and MIT. 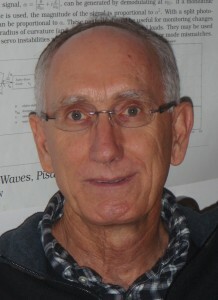 Richard Savage, who earned a bachelor’s degree in physics (’78), and master’s and doctoral degrees in electrical engineering (’88 and ’92, respectively) at UCLA, is a scientist at LIGO’s site in Hanford, Wash. One of the many authors on the paper announcing the discovery, Savage’s role in the research includes improving the sensitivity of interferometers, stabilizing lasers and calibrating detectors. He recently answered a few questions about the historic discovery from one his mentors at UCLA, electrical engineering professor emeritus Francis Chen. CHEN: Please describe the moment when you learned that a gravitational wave signal had been detected. SAVAGE: We were operating in an “engineering run” on Sept. 14, 2015, two days before our first “observing run” was to begin. We were operating the detectors 24 hours per day and testing all of the software, including the pipelines that look for coincident triggers (potential signals) in the data. Triggers are reported in real time on web-based summary pages that members of our collaboration review. Q: Are the LIGO signals continuously recorded? How long does the signal last? A: There are numerous pipelines analyzing the data from our interferometers. They look for different types of signals, for instance those that would be generated by the inspiral (the process in which two bodies capture each other gravitationally, orbit around each other, and move toward the center of rotation) and coalescence of compact binary objects such as black holes or neutron stars, as well as the short burst of gravitational waves that might be generated by an asymmetric supernova implosion. In the case of the binary black hole merger, that system was generating gravitational waves for many millions of years, but it was only the last few tenths of a second of this inspiral that generated gravitational waves strong enough and at high enough frequency that we could detect them with LIGO. Q: Since the LIGO arms are miles long, how accurately can the time of the event be determined? A: We have atomic clocks at each of our sites (Hanford, Wash., and Livingston, La.) that are synchronized with GPS time signals. They enable us to determine the timing of our signals with absolute accuracy of about 10 microseconds. The arms are 4 kilometers long, so it takes light about 13 millionths of a second to travel along the arms. It is really the relative timing between the two LIGO sites that is important for us to be able to extract as much information as possible from the gravitational wave signals. The LIGO sites are separated by 3,000 km, so it takes light about 10 thousandths of a second to travel between the two sites. Depending on where the source of the gravitational waves is located on the sky, the difference between the arrival times at the two sites can vary from arriving at the same time to a maximum of 10 milliseconds delay. The Sept. 14, 2015, signal arrived at the Livingston observatory first, then at the Hanford observatory seven milliseconds later. This delay tells us roughly the direction to the source. Q: How conclusively does this event confirm Einstein’s prediction of gravitational waves? A: Even Einstein vacillated on whether or not gravitational waves really exist. In 1916, the year after he introduced his theory of general relativity, he first introduced the theory of gravitational waves. Then, in 1936 he submitted a paper to the Physical Review that purported to prove that gravitational waves don’t exist. The reviewer caught an error in the calculations and the conclusions were subsequently reversed in the published version, now concluding that gravitational waves do exist. This existence debate, including whether binary star systems emit gravitational waves and whether detectors such as LIGO could really detect them, continued well into the 1970s. Only in the 1980s, with the observation of the rate of decay of a binary pulsar system (PSR 1913+16) by Weinberg and Taylor, was the scientific community finally convinced that gravitational waves really do exist and that binary systems emit them as they spiral toward each other. Our detection gives definitive evidence for the existence of gravitational waves. Further, it proves the existence of black holes with masses 20-30 times that of our sun, and it proves that binary black holes exist and merge as predicted by general relativity. Further observations with LIGO could give us an indication of what the state of the universe was much closer to the time of the Big Bang. Q: Regarding the first version of LIGO, what was the mood among researchers after it didn’t detect anything? We knew, and the National Science Foundation knew, that we would have to be very lucky to see a signal with the initial LIGO. A gravitational wave event would have to occur close enough to Earth that we could detect it with the lower sensitivity we had at that time. In parallel, we designed an upgrade that we call Advanced LIGO and we convinced the NSF to fund its construction. It promised a factor of 10 increase in sensitivity, which translates into roughly a factor of 1,000 in event rate (volume of space probed increases as the cube of the distance to which we can see a source). After working so hard to get the initial LIGO detectors operating, it was very hard to shut them down and tear everything apart, but the promise of a factor of 1,000 increase in event rate meant that one day of operating Advanced LIGO would be equivalent to three years of operating initial LIGO. We are fortunate and grateful that the NSF, and the taxpayers, were willing to support this upgrade. Of course we worried that the “event of a lifetime,” maybe a supernova in our own galaxy, would go off when we had our detector in pieces. Q: What advice would you give students about a career path that may lead to something as important as this, or may not? A: I feel very fortunate to have had the training that I had at UCLA, which resulted in the opportunity to join LIGO and participate in this effort. As scientists, I think we are really fortunate in that our work is almost always fundamentally fascinating, so we really can enjoy the traveling as much as the arriving. To the extent that one can enjoy the journey, even knowing that the final goal may not be reached but that he or she is one of the people who contributed to the overall effort, I recommend it highly. Q: What did you learn at UCLA that has most helped you to carry out your career, and this endeavor, successfully? A: With regard to science, almost all of my roots are at UCLA. I met my lifelong friend Dan Goebel in a physics class in Kinsey Hall in 1974. He told me of a part-time job working in the Plasma Lab under Professor Chen and Professor Neville Luhmann in electrical engineering, where I learned to build hardware for experiments, in particular laser systems for plasma diagnostics. In 1986, with encouragement and support from Professor Harold Fetterman, I decided to go to graduate school in electrical engineering at UCLA. My good friend Ken Marsh told me of an opportunity in the group led by Professor Chen and Professor Chan Joshi, and I readily signed on to do experiments with lasers and build the femtosecond pulsed laser system that I used for my Ph.D. research. It was in that group, working with Ken, Chris Clayton, Professor Warren Mori, Professor John Dawson, fellow students, and others, that I was exposed to the challenges of really difficult experiments and the successes of a really dedicated, really competent, and really persistent team in overcoming what appeared to be insurmountable obstacles. Today, almost 25 years after graduating from UCLA and moving to Caltech, I’m still inspired by the time I spent in Chan’s group at UCLA and I’m still benefiting from what I learned with them. It’s not only what they do, but how they do it that makes a difference. I hope that at least a little of that has rubbed off on me. 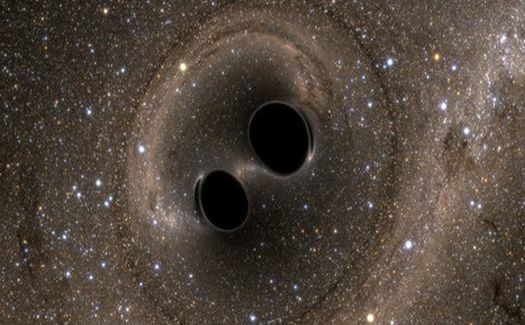 Photo: Black Holes merging. Photo courtesy the Simulating eXtreme Spacetimes (SXS) project.